this is my last blog post as a part of Pink and Main design team. I want to to thank you for your all lovely comments. I hope you will be fan of Pink and Main forever! For today I decided that I will make something special, small note cards. Sometimes you just want to make small note for somebody. This is the right time to make note cards with me. You will need just white card stock to create base – make any size. Than blue card stock for waves – use Waves Border Dies. 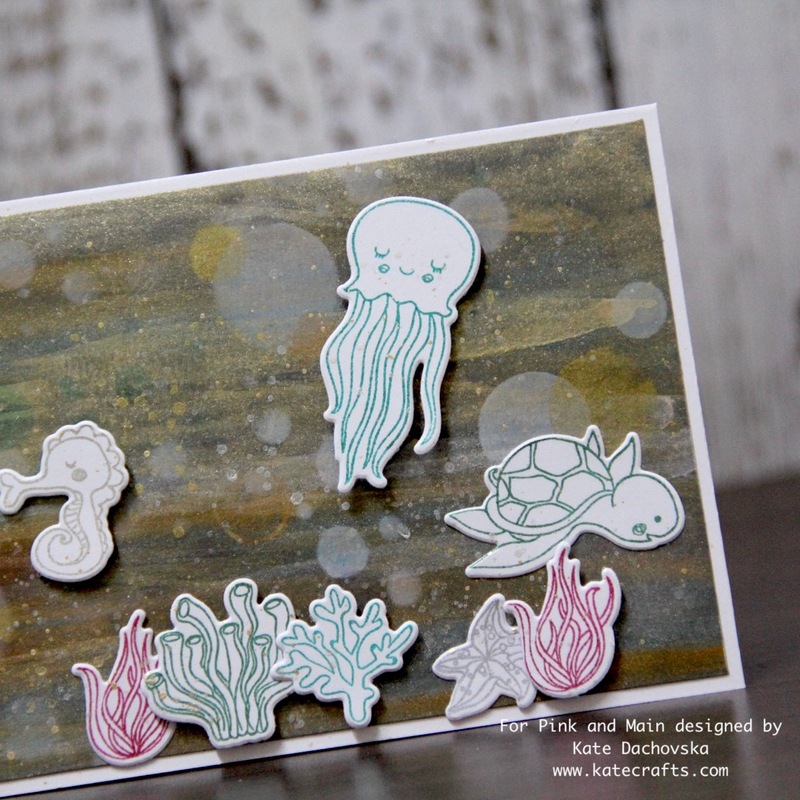 Stamp your fish – Narwhals, die cut it – Narwhals dies. Colour it – I used Zig watercolour markers. Stamp your note inside prepared foled note card. Glue waves but leave opening at upper side to make pocket for fish. Do not glue fish just put it inside wave. So your note card will be very playful. I hope you love June release as I do. For today I have a little bit mixed media card. From watercolor paper I cut rectangle – I used – Stitched Rectangle Set 1 Dies. Than I applied sand paste through stencil from my stash. From kraft paper I cut shells with – Fancy Shells Dies. At another watercolor paper I stamped with Versa fine onyx black sentiment from – Shellebratestamp set. And I finished card. 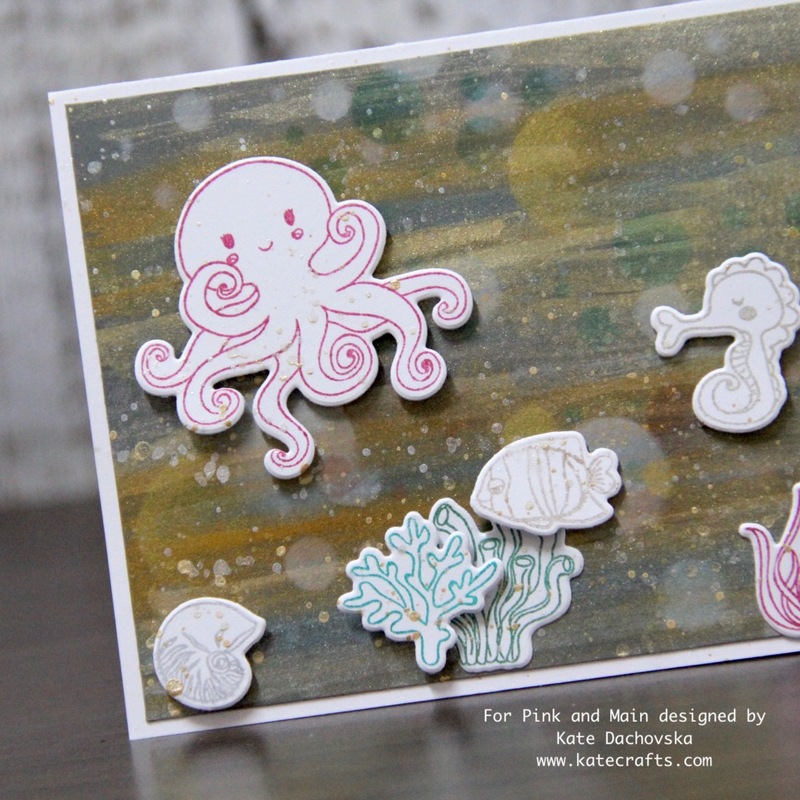 for today I made two cards because there are so amazing stamps in new release. Both cards have got the same steps. First I cut rectangle from watercolor paper I used – Stitched Rectangle Set 1 Dies. Than I took amazingFor Point Star Stenciland Puffy Heart Stenciland I made background with Distress oxide inks. All. images are from new stamp set – Mermazing Coffee- images are stamped with Versa fine onyx black ink and coloured with Zig watercolor markers. I used also Mermazing Coffee Dies. Images are glued with 3D foam tape. 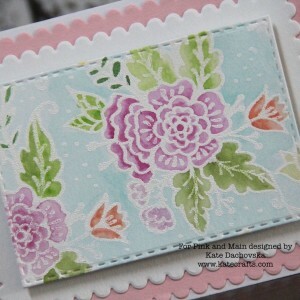 I would like to share with you layered romantic card. 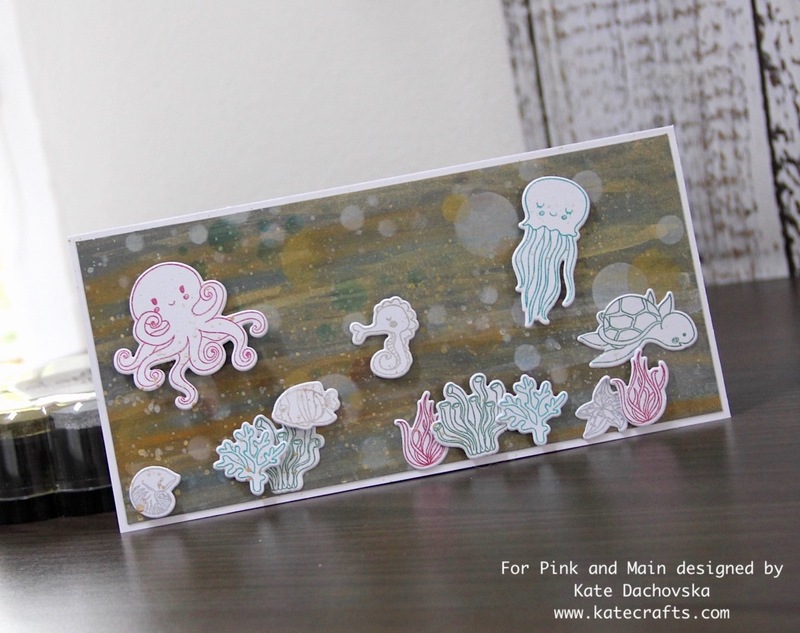 The two first layers are made with new Scallop Rectangle Dies – I cut rectangle from pink and white card stock. 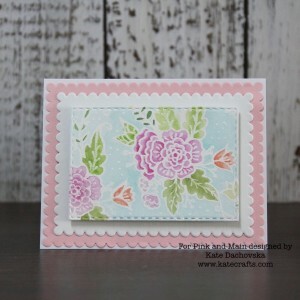 Focal point is rectangle (Stitched Rectangle Set 1 Dies) made from watercolor paper with stamped image (Floral Background ) – heat embossed with white embossing ink and coloured with Zig watercolour markers. I like to make simple but layered cards. 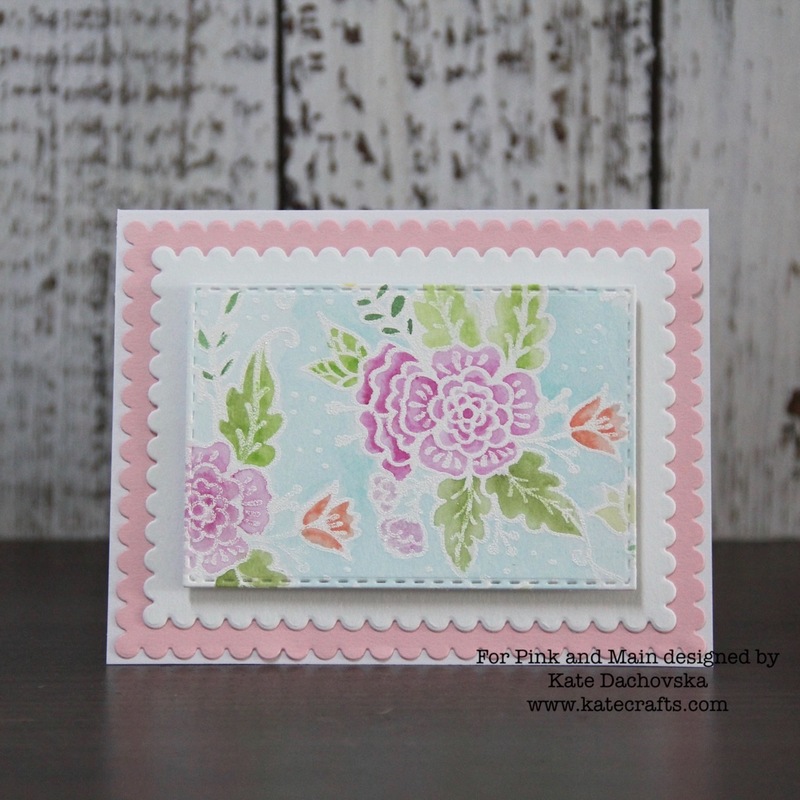 With Floral Background stamp you can make many great cards. Welcome to our blog hop! We hope you enjoy the inspiration found on the team blogs from Pink and Main and Clear Snap. welcome to my blog. I would like to share with you my card with undersee scene. Under the see there is magic world full of nice creatures. I wanted to make card like this. 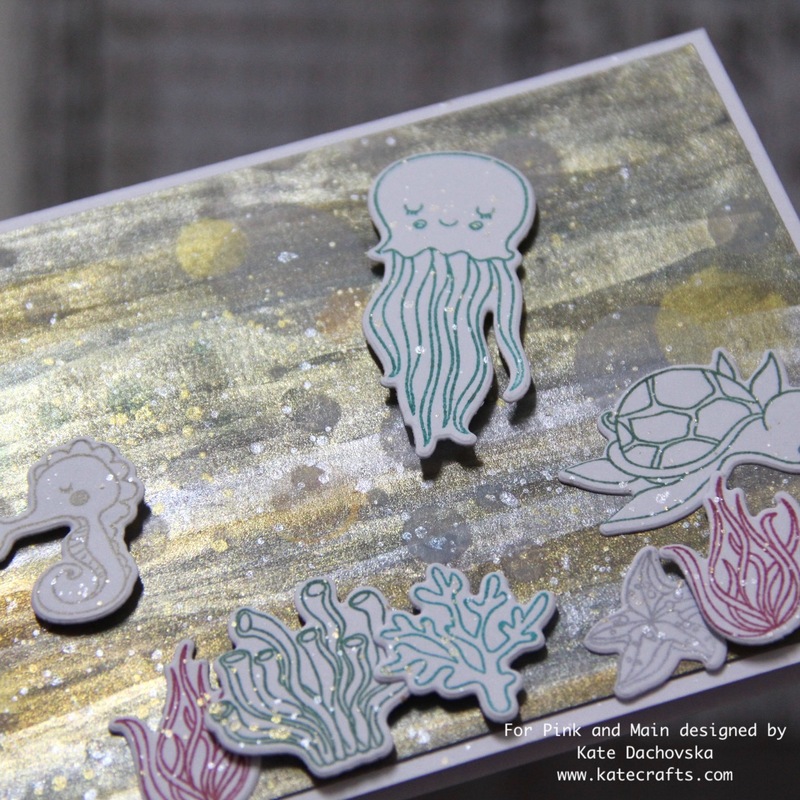 All images are from Seas the Day stamp set and I also used Seas the Day dies. All images are stamped with awesome Clearsnap Color Box Metallic Petal point. It is great pigment ink in metallic colours. Background: I worked on grey card stock, I applied different layers of watercolours Gansai Tambi Starry colours, when everything dried I took stencil for bokeh effect and white ink and again metallic inks and I made bokeh effect on background and last layer are different splatters. I wanted to make magic undersea background. Unfortulately as usually there is no way how to make brilliant shiny photo, so you can find that shiny effect on my last photo when I hold card and took photo in angle. There are prizes available for this hop! Pink and main will be giving a $25 gift code to their website, and Clear Snap will be giving away a prize pack valued at $25. All you have to do to win a prize is hop along the blogs and follow and leave comments on their posts. We will choose 2 random winners from the comments posted. We will post the winners on June 1st. Here is the lineup for the hop… enjoy!